If the controversial vote taken in Crimea recently is upheld, and Crimea does in fact separate from Ukraine, it could mean big problems for the county's methadone patients. For many years, Russia and Ukraine have both been battling an epidemic of IV drug use, as well as the diseases and health problems that go hand in hand with it. The two countries differ greatly though on how they are dealing with this problem. "Ukraine and Russia both have large HIV epidemics driven by drug injection, Ukraine has moved successfully to slow the spread of HIV, including with the prescription of the daily medicines methadone and buprenorphine to help patients stop injecting street drugs and manage the struggle with addiction." The most common prescription treatments for addiction mentioned above (methadone and buprenorphine) are sadly not available to addicts in Russia. "Russia prohibits these medicines, a ban dating back to a reality-by-decree in the 1950s that claimed drug use was a product of unregulated and decadent Western individualism impossible in the worker-owned state of the USSR." Not only are threat treatments unavailable, Russia distorts the medically accepted facts on addiction treatments, and even goes as far threatening physicians attempting to discuss it. "Russian officials, psychiatrists known as "narcologists," define the terms of addiction treatment and dismiss or distort evidence from other countries, including Ukraine. They have gone so far as to close down websites and threaten Russian doctors who even mention methadone or buprenorphine." Terrifyingly, if Crimea does become part of Russia, there isn't much that can be done for methadone patients in Ukraine. "There is only a few months' supply of medicine left in Crimea, and the authorities in Kiev say it may not be possible to send more in given the Russian troops massed on the peninsula." As a current methadone patient myself, this is beyond frightening. 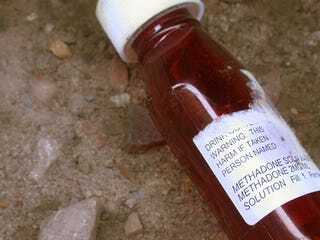 If I was to suddenly cease my daily methadone treatment, I would be in for an awful experience. Not only would my cravings for opiates return, withdrawal symptoms would be terrible. Looking to make the pain and withdrawal stop, addicts will often return to IV drug use, and crime or prostitution to fund it, as well as being exposed once again to the health risks of IV drug use. How can Russia continue to deny its scores of addicts a medically accepted treatment that offers a way out of the darkness that is addiction? "The fact that Russian approaches do nothing to reduce drug use, or that associated HIV infections have continued to surge in Russia, is less important than the Putin party line that says morality is sufficient medicine"
Addiction shouldn't be a death sentence, but when morality is treated as medicine, death and disease is all to common.